Have you ever been in Mataram, the capital of Lombok? It’s quite an impressive city and you’ll find something interesting and exciting on every step of the way. Different parts of Mataram look very different from each other, and that’s the beauty of it. Ampenan, for example, is famous for the Dutch legacy. Back in the day, it used to be home for many European traders. The center of the city is more technologically advanced, while the outskirts look more authentic. The Lendang Re village is located in the Cakranegara district. You won’t have a problem locating it, as the locals will show you the right direction. Check the map below to see the exact location. So, what is this place all about? Why should the regular tourists even consider visiting it? First of all, as I just mentioned, every part of Mataram is worth checking out. Secondly, this is the unofficial center of the island’s furniture. That’s right: in this beautiful village, you’ll find some of the best furniture/wooden items crafted by world-class craftsmen. Their craft is called “cukli”, and folks from all over the planet come here to see the masters at work. They use wood and seashells to create amazing pieces of art. Furthermore, the prices in Lendang Re are very low, which makes it a heavy competitor on the Asian market. Yes, it’s a win-win kind of a situation. The range of available items is pretty huge and includes tables, chairs, beds, trays, bowls, jewelry boxes, and more. Every single element looks unique and beautiful. I bet you’ll spend more than a couple of minutes at the stores and find yourself falling in love with what these folks have to offer. Don’t rush yourself: go around every single stand and make sure you see everything before you pick something. It would be best if you’re on this trip with your loved one, as he/she will help you with the choice. Without a doubt, the Lendang Re village is where the magic happens: it’s the pride and joy of Lombok, a place that the government considers to be important for the Sasak culture. This settlement is pretty tiny, but it’s where the mysterious cukli handicraft first came to life. Since then, the locals have been working day and night, perfecting their skills and coming up with new ways to impress the tourists. Lombok is an island full of exceptional people. Some of them carve; others weave, fish, or take care of the farms. Crafting is what Lendang Re is famous for. It is located just 10 kilometers away from Mataram. Many folks are used to calling it a part of the city, not some separate village. If you approach it from the south side, you’ll see the big iron gate with a welcoming sign that encourages you to enter. I had the privilege of talking to some of the elders in Mataram, and they told me that several families still rely heavily on their craft. These days, most of the young men and women are more interested in studying at a university and leaving the island instead of taking after their parents and carrying on the ancient traditions. Chances are, the Lendang Re village will turn into just another ordinary community in the future, as there will be no new craftsmen to keep the place going. Besides, these days, it’s not really as popular as it used to be, and mainly only the locals go there to buy some routine stuff for their kitchens and bedrooms. So, don’t miss your chance to see it all with your own eyes. The families I just mentioned live close to each other and you’ll be able to visit them all in one day. I’m not saying no foreigners ever visit the village, but it is, indeed, one of the least popular ones. The market of cuckli handicraft is very narrow. On the other hand, these craftsmen are the only ones that have mastered it, which means they’ll always have that niche to themselves. Mahogany wood is expensive – it is usually imported from Java (the island); same goes for the seashells: the people of the Lendang Re village import it from Bali and the neighboring islands. 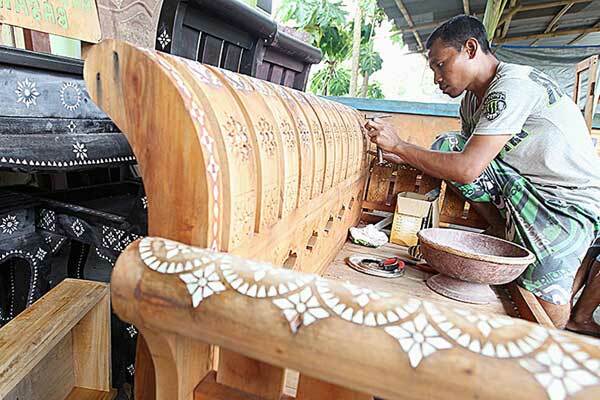 Now, even though these masters know their art by heart, sometimes, they send some of their best work to colleagues in the Labuapi village for a finishing touch. This type of “collaboration” is actually a pretty rare thing in Lombok. People are used to helping each other, that’s true; yet, working together on one project is not really something they usually do. As soon as you enter the village, you’ll be overwhelmed by the number of craftsmen working on their new items. Some of them are busy making holes in the wood; others are cutting the seashells into several tiny pieces; the rest are grinding them for polishing. The Lendang Re village is very friendly and the locals will stop what they’re doing to help you with whatever question you’ve got. Oh, and by the way, if you’ve got some crazy ideas and want to implement them into reality, they will be more than happy to help you with that. Just make sure you draw the sketches right. There’s no need to hang around for hours or even days before the craftsmen finish your order. Go back to your room or do more sightseeing and have them deliver the good to your hotel. Yes, service in Lombok is good, even though the Lendang Re village might not look as good as the rest of Mataram. It would be wise to ask the local masters permission to take a look at their work. Again, people over there are nice and friendly, but that doesn’t mean you can just barge in there. It might be a bit challenging to find Lendang Re, because there aren’t any signs that will point you in the right direction. The citizens of Mataram, on the other hand, will be able to help you. Even if you can’t speak Sasak, just mention this village. One final thing: if you’re not here for sightseeing and want something specific to be made for you, don’t forget to have some kind of a drawing with you. Show it to the craftsmen and let them be for a while: they’ll do the rest. Being the capital of Lombok, Mataram is full of restaurants, cafes, hotels, and guesthouses. You won’t have a problem finding places that fit your budget and offer a decent service. Lendang Re is a bit “modest”; so, if you’re looking for those elite options, go further into the center of the city. One of the greatest things about this island is diversity, along with affordability. Tourists on a low budget can easily find rooms to crash in, while the richer foreigners will be satisfied with the high-level service. As for the village, it looks nice and “tidy”, despite the fact that some of the locals are struggling with money and dreaming of better lives. Ok, this is the last chapter, dear readers. It’s time to check out the routes that lead to our destination. So, the Lendang Re village is located just 10 kilometers away from Mataram, as I mentioned in the beginning. That means if you already are in the capital, forget about renting a car and just walk all the way up to the settlement. From the Lombok International Airport, the road will take approximately 1 hour. It depends on the route you choose. The fastest one is through Jl. Bypass Bandara Int. (50 minutes tops), but there might be a lot of traffic there. It is 33 kilometers long. The second route is 40 kilometers long, and you’ll have to drive for 1 hour and 15 minutes. At the same time, it’s a lot less busy route, and you might just get to Lendang Re faster. As always, the visitors are free to choose between public transportation (boring and slow), hiring a taxi driver (expensive but fast, reliable, and fun) and renting a vehicle (even more fun). Most tourists prefer to rent bikes and ride along the beautiful beaches, waterfalls, and forests. Driving is an entirely different kind of pleasure in Lombok, as the island looks marvelous. Go for a little drive after you talk to the craftsmen of the village and reach an agreement concerning the deadline for your order. We ended up ordering a huge pile of stuff from these people. Everything is affordable; the service is good. You'll be impressed by the available options once you step foot in Lendang Re. I've been to Mataram more than once but never really knew about this place. Most people buy furniture in Lendang Re, but I chose the lovely handicraft tables and chairs. For the regular tourists, the beautiful shops with cheap price-tags will be like a goldmine.